Traveling in Japan can be tricky, but we're here for you! We put together these tips to make sure your trip will be a huge success. Japan is a cash culture. Most businesses in Japan do not accept credit cards, and this is especially true once you're out of the major cities. You should expect to not be able to pay for anything, including hotels, with cash. Bring enough to cover expenses, and then some for emergencies. If you happen to run out of cash while you're in Japan, all post offices and many convenience stores (Family Mart, Lawsons, 7/11) have international ATMs that you can use to withdraw more yen. Traveling in Japan means riding lots of trains. The stairs in train stations are numerous, and in most of the smaller/more rural stations there are no escalators or elevators to assist with large bags. Stations can also be quite crowded and a larger bag is cumbersome to navigate with. If it's not possible to pack light, Japan has an incredibly convenient courier service called Takkyubin. This is a luggage forwarding service that will quickly transfer your luggage from one hotel to another so you avoid the hassle of dragging it through train stations. With a day or so of notice most hotels and ryokans will be able to set this up for you. Packing shoes that are easy to slip on and off will make traveling in Japan a lot easier. If you ever enter someone's home, or any room with tatami mat floors, you'll be required to remove your shoes. When I moved back to the states from Japan and discovered the Japan Rail Pass*, I thought I might be in heaven. The Rail Pass gives tourists access to the entire JR train network including the bullet trains, and allows you to travel around Japan for a much less expensive price than you'd pay otherwise. 7, 14, and 21 day passes are available, and you must order your Rail Pass before your leave on your trip. * The Japan Rail Pass isn't valid for the subways, or any other non-JR train. If you're a luxury traveler the Japan Rail Pass may not be the best option for you. Navigating the train system in Japan can be intimidating, but Hyperdia is your friend. This site allows you to input where you're taking a train from and where you'd like to go. It will show you the fastest way to get to your destination station, where to transfer, and how much the route will cost. I am constantly using Hyperdia while traveling Japan. The site will also filter types of transportation for you. For example, if bullet train is an option for your route, you can leave it checked and your search results will reflect routes that allow you to take a bullet train. For Japan Rail Pass users, you can unselect Private Railway options so that your search results will be accurate as to what you can take with the Rail Pass. Free wifi in Japan is extremely hard to find, even in coffee shops. More hotels and ryokans are offering it (in the cities, but rural areas are another story), but if you're exploring and need to look something up right away, wifi won't be readily available. The best solution is to rent a pocket wifi device. You can easily use this device anywhere there is cell service (almost anywhere in Japan) to connect your laptop, smart phone, or tablet to the internet. It is necessary to order your pocket wifi in advance. PuPuru is a well-known and reliable option, and you can even add a Japanese cell phone to this order as this is often less expensive than using your phone from home with an expensive roaming plan. Starbucks in Japan does have free wifi, but you have to register in advance in order to use it. You can do this here before you leave on your trip! Though Japan is extremely clean, public restrooms, especially those in train stations do not have soap or towels to dry your hands with. Most Japanese people carry a small hand towel with them, and we recommend you do the same! It is also convenient to carry a small hand soap or hand sanitizer with you for public restroom situations. If you are going to be hosted by anyone in Japan, it is customary to bring a small gift which is known as omiyage. The best omiyage is edible, such as small individually wrapped chocolates from your home country, and will go a long way in furthering your relationship with your host. The omiyage should not be hand made, but it doesn't need to be expensive either. Two Japanese students visited a friend of mine in Colorado recently, but because she had to work, I picked them up from the airport and showed them a few sites around town before she could catch up with us. Because they knew I was going to be doing this, they brought me several packages of Japanese cookies. This is a great example of when to give someone a small gift, and what sort of gift is appropriate. As with any time you travel to a foreign country, there will be many things that you don't know, and many things that are confusing to you. Japan highly values harmony and interacting in a polite way with everyone you encounter. Traveling in Japan with a humble attitude, and a willingness to learn will make your experience there infinitely better. It's also quite important to be quiet on trains, and in other public spaces. The Japanese refer to someone who can't read body language or take a hint that their behavior is inappropriate as kuuki yomenai. Literally this means, "can't read the air". If you are kuuki yomenai, traveling in Japan will be more difficult for you because fewer people will be inclined to help you out when you need it. We hope this helps you as you plan for your trip in Japan! 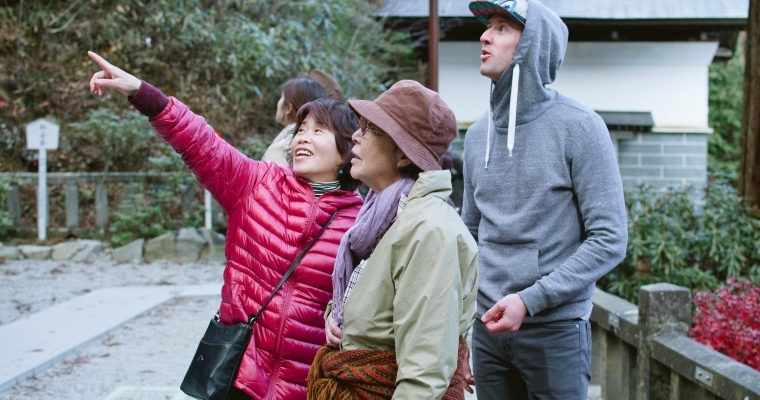 Sign up to receive information about our upcoming trips, as well as more Japan travel tips. If planning your own trip is intimidating and you'd rather have someone else take care of those details for you, we're here for just that purpose!